Communities across Wales are being encouraged to take advantage of a special Welsh Government grant to repair and conserve community war memorials as part of the First World War centenary commemorations. The Grants for War Memorials scheme is offering communities the chance to apply for funding up to 70% of eligible cost and up to a maximum of £10,000 to conserve all types of war memorials. War memorials are familiar sights in communities throughout Wales, from commemorative structures to fittings in churches and chapels; they continue to be the focal points for services of remembrance. 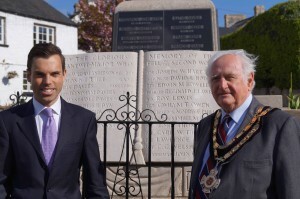 The Deputy Minister for Culture, Sport and Tourism, Ken Skates, today visited the Llantwit Major War Memorial, which recently benefited from the grant to sharpen and deepen the existing lettering to make it legible again. “There are some 4,000 war memorials in our communities across Wales, each telling a story of the lives lost and communities and families devastated by the effects of war. They are a symbol of our need to remember. The Grants for War Memorial Schemes has been developed in partnership with the War Memorial Trust and is administered by Cadw, the Welsh Government’s historic environment service. It is linked to the Welsh Government’s Cymru’n Cofio Wales Remembers 1914-18 programme, which is leading commemorative activity in Wales in partnership with key organisations. Information about past and future commemorative events and projects across Wales can be found in the recently released annual Cymru’n Cofio Wales Remembers 1914 -1918 brochure ‘Programme 2015’ (http://www.walesremembers.org/1915-1918-programme/) and at www.walesremembers.org.